Success! 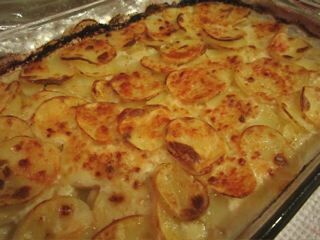 I have conquered scalloped potatoes au gratin and am inspired to make them again – but better! I would definitely add more cheese on top because I like them to be a little more cheesy and a more substantial “crust” on top. I am thinking about putting in some finely chopped oyster mushrooms between layers of potatoes. Bacon or pancetta would be good, too. The possibilities are endless! All in all they were really easy to make and are perfect for a Sunday night dinner because they do take a while in the oven. I researched several different recipes and ultimately came up with my own recipe. I started out with Ellie Krieger’s recipe but I used 2% milk instead of 1%. I warmed the milk with whole garlic cloves to infuse the milk rather than have actually garlic chunks. I also used this awesome Gruyere Cheddar cheese blend I found at Trader Joe’s. I also decided not to cook the potatoes first and put them in raw instead. My recipe follows. 5. Spray a baking dish with the oil spray and arrange about 1/3 if the potatoes on the bottom of the pan and sprinkle on some cheese. Repeat until all the potatoes are arranged in the dish. Top with the last bit of cheese. 6. Pour warmed milk over the entire thing. It is going to seem like a lot of liquid but, trust me, the potatoes soak it all up. Remember that when you are adding salt to the milk mixture – you’re going to want to put more than you think. 7. Bake covered in foil for 45 minutes then take out, take off the foil, and put back in for another 25 – 30 minutes. Let cool and (if you can wait) DIG IN! And that’s what I did! Yum!